Oak is a beautiful hardwood with attractive grain patterns, an eye-pleasing color and a reputation for durability. The wood is highly sought after for cabinets, doors, flooring and furniture. The appeal and popularity of oak stands the test of time. Unfortunately, the high demand for this slow-growing tree has reduced available supplies and raised the price. Ever-rising oak prices could make your dream-kitchen of oak cabinets remain only a dream. The good news is there is an excellent alternative – faux oak wood graining. This process successfully recreates the appeal of oak wood without the cost. Faux oak wood graining can take on a variety of hues: light yellows and browns which imitate young wood; medium yellows and browns which imitate more mature wood, and just brown, which imitates old wood. Here are some basics of the faux oak wood grain technique, using a cabinet door as an example. Prepare the surface. Remove door from the cabinet, and remove any hardware like knobs and hinges. Clean the door with mild soapy water and a damp sponge. An old toothbrush dipped in soapy water will help loosen dirt that builds up in the corners over time. Let dry completely. Lightly sand all surfaces then remove all dust. Apply primer. A quick drying latex primer is an excellent choice. Using a two or three-inch wide soft nylon bristle or foam brush, apply at least one coat of primer to the cabinet door and let dry thoroughly. The primer should be tinted to match the lightest color in the wood. An oil base primer can also be used but in that case, use a natural bristle brush. The primer will serve as your background wood color, so choose this color carefully. A light tan color works the best for most wood graining. Create the wood grain. One method of creating faux oak wood grain is by using a rocking tool. This tool creates the look of grain by removing some of the glaze applied in step 3, revealing the basecoat. The glaze that remains on the cabinet creates the wood grain effect. Start at the top of the cabinet and work toward the bottom. Rock the tool forward and backward slowly, while moving it down the cabinet. Don’t overlap the strokes. It takes a bit of practice to master moving and rocking the tool simultaneously. You may find it much easier to use graining rollers. The rollers are more expensive, but you will be able to do the job faster. A wood grain roller is also a great choice for beginners. A roller works in a similar way to the rocker, except rather than rocking the tool you simply roll it to create the wood grain pattern. There are two methods of using a traditional rocking tool. Half Rocking. Position the rocking tool at the top of the cabinet, with the handle straight up – in other words, very close to the board. Pull (never push) the rocker down the cabinet slowly. As you do so, rotate the handle downward, toward the surface. The rocking tool will be moving down the face of the cabinet while you “half rock” the tool. Wipe tool clean after each stroke. After the glaze has set-up but not dried completely, use a natural bristle brush to lightly brush over the grain. This will soften and authenticate the real wood look. Let dry. Full rocking. Start at the top of the cabinet just as you would for half rocking. As you pull the rocking tool toward you, pull the tool all the way forward and back in one fluid motion. You’ll end up with a full grain pattern. Wipe the tool clean after each stroke. After the glaze has set-up but not dried completely, use a natural bristle brush to lightly brush over the grain. This will soften and authenticate the real wood look. Let dry. Apply the protective coat. 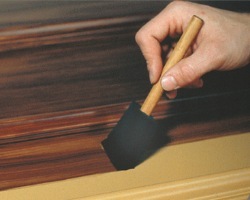 Use polyurethane or varnish using a soft bristle or foam brush. The coating will protect and help bring out the faux wood grain. Tools and materials to create faux oak wood grain using glaze. Metal, fiberglass and other smooth surfaces. – Determining the direction of the wood grain can be difficult. 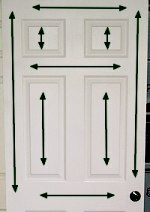 For doors the sections running vertically on the far right and left has vertical grain. Horizontal sections have horizontal grain. For cabinet’s drawers run horizontally, tops run horizontally and doors run vertically. Joining the stain where there are joints or cross-grain. – Mark a light line with a pencil and apply tape along the line. 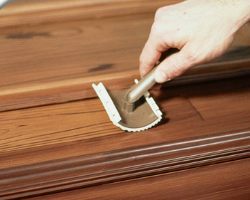 Immediately apply the stain and carefully make the wood grain pattern using your graining tool, up to and slightly onto the tape. Carefully remove the tape when satisfied wit the result. Never leave the tape in place overnight. The rocking roller and rocking tool are great choices for anyone just starting to learn how to faux wood grain. Consider purchasing two or three rocking rollers or tools in a variety of widths and grain patterns. Using more than one rocking tool will enhance the natural look of wood grain. A variety of wood grain looks can be created by varying the speed at which you drag the rocker, or the number of times you rock the rocker. Most rocking tools are priced in the $5.00 to $15.00 range, and can be found in the faux finishing paint section of nearly any home improvement store.